Mung beans are tiny, green or olive-green seeds in the legume family plants, originally from India. They are best known in the USA and the western world for their crunchy, nutritious bean sprouts. Botanically, they belong to the Fabaceae family in the Genus: Vigna. Scientific name: Vigna radiata..
Mung eans, whole and split. Mung bean is an annual, branched, dicotyledonous plant which grows about 60 to 75 cm tall. The plant is considered to be heat and drought tolerant. The pale yellow flowers appear in clusters which eventually develop into thin cylindrical pods. Pods are 6 to 10 cm in length, each having 10 to 15 seeds. The seed color exhibits a wide range of variations at maturity from being predminantly shiny green to light-green, deep-green, dull green, greenish-yellow, to rarely black-mottled. The seeds are free from glycosides, and can be eaten raw. Boiled seeds are soft textured and gently sweeter on the palate. Harvesting should be done when pods are mature and dry, but before they start shattering. Mung beans are moderately caloric, protein-rich, low-fat and cholesterol-free food ingredients. They contain less of antinutrient compounds unlke other beans and pulses and do not contain glycosides. 100 grams of dry seeds contain 347 calories, and 23.86 g or 43% of recommended daily values of protein. Whole mung beans carry higher concentration of dietary fiber for their size; provide 16.3 g or 43% of fiber per 100 grams. Dietary fiber works as a bulk laxative, which thereby protect the colon mucosa by decreasing its exposure time to toxic substances as well as by binding to cancer-causing chemicals in the colon. Dietary fiber has shown to reduce blood cholesterol levels by bringing down reabsorption of cholesterol-binding bile acids in the colon. Mung beans are gluten-free food items. They particularly preferred as gluten-free food alternatives in gluten-allergy and celiac disease patients. Whole as well as sprouts carry good amounts of B-complex vitamins, especially folates, thiamin, pyridoxine, pantothenic acid, riboflavin and niacin. Most of these vitamins works as co-factors for the enzymes in carbohydrate, protein and fat metabolism. Whole dry seeds carry 625 μg or 156% of daily required value folate. Folate, together with vitamin B-12, is one of the essential co-factor for DNA synthesis and cell division. Adequate folate in the diet around conception and during the pregnancy may help prevent neural-tube defects in the babies. While dry mungbeans hold 4.8 mg or 8% of DV of vitamin-C, sprouts carry many times more of this vitamin. Vitamin-C is a water soluble antioxidant which helps in boosting immunity, and fight against the oxygen-induced free radicals in the human body. Furthermore, they are incredible sources several essential minerals. 100 g of dry mungbeans hold copper-104.5%, iron-84%, manganese-45%, phosphorus-52%, selenium-15%, calcium-13%, and zinc-24%. Both copper and iron take part in the production of blood cells in the human body. Moreover, they are also very good sources of potassium. 100 grams hold, 1246 mg or 26.5%. Potassium is present inside cell and body fluids, which counters pressing effects of sodium on the heart and therby decreases blood pressure. Fresh dry mung seeds can be readily available in the retailer shops all round the year. In the store, choose dry seeds packed in bins or bags. Whole, or split, or yellow (split and hulled) beans can also be put for sale. Avoid insect-damaged, broken, shriveled, discolored beans as they sound inferior quality. Mung bean sprouts are sold in plastic trays or bags. To enhance shelf life, keep the sprouts in a plastic bag with a few drops of water, seal and keep in the refrigerator. Stored in this manner, they will last for up to two days. At home, store whole dry beans in plastic/steel containers away from moisture and heat. Whole seeds can keep well for several months if preserved in air-tight bins. Most Asian households use mung beans on daily basis in the diet. The beans contain less anti-nutrient compounds; unlike most other beans and peas. They pose fewer problems on the digestive system and can be included in infant formulas as a protein source. Soak whole dry beans in water for 1-2 hours. Although soaking is not mandatory, it quickens overall cooking time, removes anti-nutritional compounds, and enriches flavor. Pressure cooked for 10 min with soaking; 15-20 minutes without soaking. Avoid overcooking. Mungbean are mainly featured in cuisine in China, India, Japan, Korea, and Southeast Asia including Thailand, Vietnam and Indonesia. The mung bean is best known in the USA, where it is used for their sprouts. The mung bean sprout is a basic ingredient chop suey, and is used in salads and Asian style dishes. Mung beans are used in the same way as other legumes, which they can replace or be used in combination with. They feature in many traditional Indian dhal recipes with seasonal vegetables, herbs and spices. In India and Pakistan, mung dal ki halva is a sweet dessert prepared with yellow split (hulled) mung beans, added with nuts and dry fruits. In Maharashtra, mung bean usal prepared with sprouted beans, onion, tomato, and seasoning is a special breakfast recipe. Mung bean parantha is yellow-split mung dal stuffed bread, popular in Punjab province, India. In Japan, China and South-East Asian regions, mung bean sprouts used in stir-fries, and as a garnish on the dishes. The immature pods can be prepared and cooked in the same way as green beans. Mung beans are very easily digested legumes and rarely pose flatulence problems. For the same reason, they can be added in infant formulas as an important source of protein. (Medical disclaimer). Black gram nutrition facts and health benefits. Chickpeas nutrition facts and health benefits. Navy beans nutrition facts and health benefits. 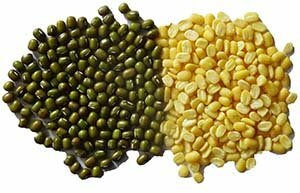 <<-Back to Legumes from Mung bean nutrition. Visit here for an impressive list of vegetables with complete illustrations of their nutrition facts and health benefits.